(Nanowerk News) Our society is insatiable as far as the transfer of data is concerned. Consequently, increasingly faster and cheaper transistors are being developed. In row in recent months, researchers from ETH Zurich have now broken the world record for the switching speed of nitride-based transistors that use silicon as a substrate several times. Although Youtube was for example only founded in 2005, 100 million videos are watched daily on its platform, and the amount of digital information in our society is constantly rising. In 2006, for example, 161 billion gigabytes of digital information were produced – three million times as much information ever stored in books. What’s more, by 2010 this figure will already have increased to about 1000 billion gigabytes per year. 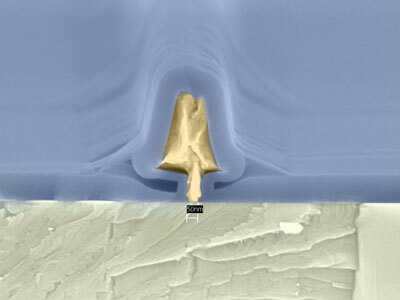 Photo of a transistor cross-section. Such cross-sections are used to characterize the fabrication process. The transistor is wrapped in a passivation film out of silicon nitride (SiN) intended to protect it from the elements (Photo: ETH Zurich). Few people are aware that not only does one always need better software to process such enormous amounts of data, but that the demands on hardware also continually increase. Transistors are pivotal elements in this struggle: small semiconductor components that can be controlled through the flow of electrons to work like microscopic switches or amplifiers in the nanometer scale. Colombo Bolognesi, Professor of TeraHertz Electronics at the Laboratory of Electromagnetic Fields and Microwave Electronics, and his group are experts when it comes to fast transistors. Their goal is to improve their speed of operation. After all, the faster a transistor operates, the more information it can process in a given time. The researchers therefore combine semiconductor materials in different layers to enable the electrons to flow as quickly as possible. They also try to make the transistors as small as possible so that the electrons travel shorter distances, thereby enhancing the operation speed of the devices. These semiconductor layers have to be prepared under the cleanest conditions as they are often only as thick as a few atomic layers. Bolognesi’s research group is thus one of the principal users of the FIRST Lab (http://www.first.ethz.ch/) on the Hönggerberg. One of the special transistor technologies that Bolognesi’s group is working on is based on aluminium gallium nitride (AlGaN/GaN) and has high electron mobility, thus belonging to the “High Electron Mobility Transistors (HEMTs)” class of transistors. AlGaN/GaN HEMTs are of technological importance because they can support large current flows and high voltages while remaining functional at elevated temperatures. Over the last few months, Bolognesi and his students have managed to beat the record for the switching speed of AlGaN/GaN HEMTs on silicon substrates several times in a row: the record is now 108 GHz. “Other groups had only managed 28 GHz up to now using similar technology, so we are almost four times as fast”, says Bolognesi, putting his team’s achievement into perspective. Usually, sapphire or silicon carbide is used as the substrate material for AlGaN/GaN HEMTs. However, in consumer electronics the part price plays a big role, as does device performance. For large scale production, every cent you save on a transistor means a better profit. This is why intensive research is being conducted worldwide on realizing efficient AlGaN/GaN transistors on low-cost silicon substrates. Bolognesi and his team do not only seek to break transistor performance records; they also develop transistors for practical applications –Indium Phosphide HEMTs, for instance, which are used in astronomical applications. Bolognesi’s team produces special low-noise transistors for the Deep Space Network on behalf of the European Space Agency (ESA). American aerospace companies are actually the leaders in the field but, as their transistor technology is also applied in intelligence satellites, it cannot be sold abroad. The ESA therefore relies on ETH Zurich’s expertise for some of its systems. Bolognesi and his group are also active in the field of bipolar transistors, which are used in optic networks. Currently, the highest transmission rate for optic networks is 100–150 Gb/s in the lab (10-40 Gb/s in commercial systems). If Bolognesi’s team succeeds in improving the speed of bipolar transistors to 1 Terahertz, however, the transmission rate would double to reach 300 Gb/s or more.